9 Reasons Why I Can't Live Without My Best Shoe Stretchers!! If you’re a shoe lover like me, then you should already figure out that getting the best shoe stretcher is something that you do not know you need until you actually need it. There are lots of reasons why I can’t live without my shoe care devices in my closet. Finding the next best fashionable shoes to fit right can be very hard at times, and I don’t want my precious feet to hurt all day long wearing them. I use them to prevent corn, blisters, and hammertoes from forming or merely to be comfortable while wearing my footwear. You can buy a shoe stretcher and do it yourself, without any problems. Buying a stretcher is cheaper than to buy a new pair of shoes and they usually last forever if you choose a quality product. 0.1 How to Use a Shoe Stretcher? 2.1.2 When my feet swell up, I use my one-way shoe stretcher to give me more room in width. 2.1.7 How do I get creases out of my shoes or boots? 2.1.8 How do I keep my leather shoes from wrinkling? 2.1.9 How do I get moisture from out of my shoes after I wear them? 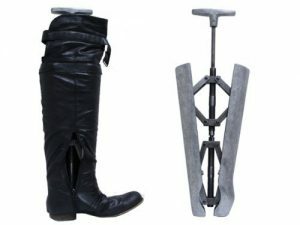 2.1.10.1 Using a Boot Shaft Stretcher is among the easiest and painless processes to extend the calf area of your boot. How to Use a Shoe Stretcher? 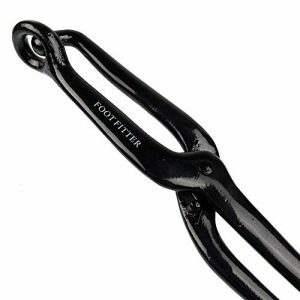 Using a shoe stretcher tool is an effective and inexpensive way to get your shoes fitting right. In essence, a shoe or boot stretcher is inserted into your desired footwear and is then safely and quickly stretched to free up extra space. This device is an excellent solution for those with corn, hammertoes, bunions or other progressive foot ailments. Shoe stretchers will help alleviate several of these problems above and provide a more comfortable shoe or boots. We will discuss later why they are so good. Below you will find some of my favorite devices. You may need more than one stretcher because they all serve different purposes. This stretcher is made up of premium beech wood. It can be used to stretch both the length and width of left or right shoes. Pressure relief pads/spot are included to extend targeted areas to keep from blisters, corns or bunions. Can be used for sandals, casual shoes, fashion sneakers, flats, wedges, leather shoes, etc. Usage, Helps with tight shoes or blisters, bunions, calluses, corns, hammertoes, overlapping toes, toe pain, and pinched toes. Just insert the shoe stretcher into the shoes and rotate the black handle and crank handle to stretch. We recommend using a shoe stretch spray along with your stretching device for fast but gentle stretching, leave in for 24-48 hours for best fit. When it comes to shoes, a lot of people rely on the professional to fix them with the right shoe care supplies. Why should they? The professional has the right equipment to repair your shoes, which makes it more comfortable to wear. Besides, they can make your shoes shine more. If you think that only they can do these tricks, then you are wrong. With the right equipment, you will be able to take care of your shoes yourself, and you will not need a helping hand. This stretcher concentrates on the width of the shoe and gets rid of the corn problem you get from the footwear. 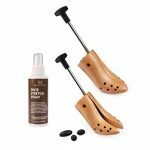 It comes with the spray, which helps the shoes to get softened up so that the stretchers can work accordingly. This device will help the shoe to fit your feet rightly. This device will transform any pair of tightly fitted shoes into the perfect fitting, comfortable shoes. It will help you with many foot problems and with foot pain caused by tight shoes. 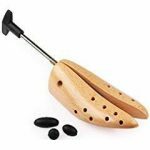 Keep shoes looking new and smelling good with these shoe trees! Premium Tennessee cedar wood that retains shoes keeping great. Unique slider-plate adjustable split toe design for ideal width match. The picture above offered in men’s sizes only. But the ones I like must is these Elements Womens Cedar Shoe Tree. Choose from a size Small to XXL. Keep the original form of your shoes by incorporating these cedar trees when not in use. This device was designed to handle certain regions of the shoe which need relieve. Having a bunion stretching tool that is used by the experts is a good thing, heavy duty cast iron makes for a durable, quality instrument. Bunions, corns, hammertoes, and foot-related stress points. Use the clamp to stretch certain areas overnight. If you’ve ever given up hope on a set of heels since they were tight onto your feet, you want these! These are great, excellent shoe stretchers, they appear to be lasting and operate wonderfully. I won’t ever attempt to ‘break in’ a tight set of heels again. A need for shoe lovers like me. They work best on 3″-6″ heels, made especially for 3″ – 6″ high heels shoes. The Liquid Stretcher Spray contains 4 oz which is good for many use. One of my best find. I have been using this shoe stretch spray over 2 1/2 years now, and it works every time. 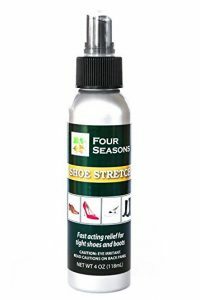 This shoe stretch spray is a miracle waiting to happen – For leather, suede or nubuck shoes – Stretches shoes in the tight spots where they grab the most. Expands treated areas without weakening the leather. Will not harm skin or stockings. When my feet swell up, I use my one-way shoe stretcher to give me more room in width. Waking up to a swollen foot sometimes can be a widespread problem. Having a lot of salt in your diet the day before can be one reason for a slightly bigger foot the next morning. Also being on your feet all day can make feet swell up as well. While I try not to wear suede shoes in the rain, you can not help it if you get caught in a downpour. There are ways to extend your suede sneakers as soon as they dry. They will not get ruined in the rain for those who own a shoe stretcher. Just let them dry correctly, then place your two-way device inside and turn the knob till it is snug. I usually wait 24 hours after this process before I wear them again. Breaking in new shoes can be a bit harsh on your feet, but a number of the typical blisters and pinching can be avoided if you know where to look. Your heels and pinky toe are evident spots, but other common areas include the tops and sides of your toes. If you are not sure quite where your problem spots will be, walk around your home for an hour or so, and you will certainly figure it out. A bunion stretcher is ideal for the toe area, and a 2-way spreader will help with the heel area. I sometimes have difficulty with corns and calluses develop in the same manner, but the outcome differs occasionally. Poorly fitting shoes are a frequent cause of both corns and calluses. They can also form when you’ve got a kind of foot deformity. To prevent hammertoe, you’ll have to wear shoes that fit your feet properly. If you don’t need to have surgery to restore your hammertoe, I propose appropriate shoes that are created with a broader and deeper toe box to accommodate your foot shape or keep a 1-way shoe stretcher that comes with bunion knobs in your closet to elongate them shoes wider when needed. How do I get creases out of my shoes or boots? When my shoes develop creases or wrinkles which are observable, it can diminish my enjoyment of wearing them. I use this technique to remove the lines. Put your wooden shoe stretcher inside your shoe and turn the knob until it’s tight. This technique will maintain the shape of the shoe, which may counteract the crease. Leave the shoe expander in the footwear for three or more days to get rid of the wrinkles and retrain the leather form. How do I keep my leather shoes from wrinkling? This process is one of my favorite thing to do. Whenever I come home from a long day out, I place my wooden shoe tree in my shoes as soon as I take them off. To absorb moisture and help them maintain their shape are the main reason. Placing your cedar shoe-tree inside your shoe when you are not wearing them is the most important thing you can do to keep your footwear from creasing. How do I get moisture from out of my shoes after I wear them? Another fantastic shoe apparatus in my closet is my cedar shoe tree extender. Reason for using cedar shoe trees in any of my shoes is as my feet sweat. That moisture accumulates in the lining of my sneakers, which not only makes them uncomfortable, it may also accelerate the deterioration of the leather. 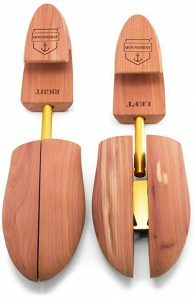 Cedar shoe trees can help to absorb that moisture, and additionally, it makes the shoe smells excellent afterward. Using a Boot Shaft Stretcher is among the easiest and painless processes to extend the calf area of your boot. The shaft stretcher will be a well worthy investment if you often have problems with boots which fit badly around your calves like me. Not only will is it the simplest way to extend a boot calf, but it is going to save you money from having to go to a cobbler with this service. 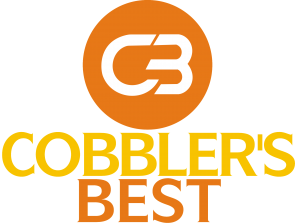 Cobbler’s charge anywhere from $45 to $65 to get the job done correctly. An additional pair of hands when required. When polishing or buffing your shoes, the wooden shoe stretcher gives it a firm inside to get the job done correctly. It’s not just great to take out crease from the footwear while shining but can help to preserve the glow also. Integrating one into the shoe you are working on, it is going to be held in shape while you’re shining. This will help makes the process much more manageable. 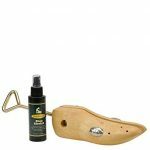 ← Why You Need to use the Best Shoe Stretcher on the Market in 2018? You are welcome Jessica, If you guys have any more problem I’m here to help.